Nidd went as a pup to the late Ronnie Kinrade on the Isle of Man. He started him nicely and let me know when he was moving him on. Simon and I had a nice holiday there when we went to pick him up. Nidd is just like Joe in that he would work for both of us, well, he only has eyes for Simon at home. Nidd and Skip make a very good team, working hard every day. Nidd has won trials from nursery and novice, through to the opens. With either of us running him. At eight years old, we should really have a litter by him, to keep a pup or two. He hasnt been able to charm a female to date. 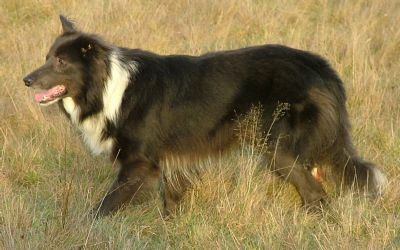 His blue colour comes from Tommy Long's Moss on his sire's side, and from dogs that go back to Harry Huddleston's blue dogs from many years ago. I know of no other blue dogs that go back to either of these lines, but there are dogs around, that go back to his blue grandmother Richard Brigg's Wenndale Bess, so the colour should crop up in the future. Photos below. 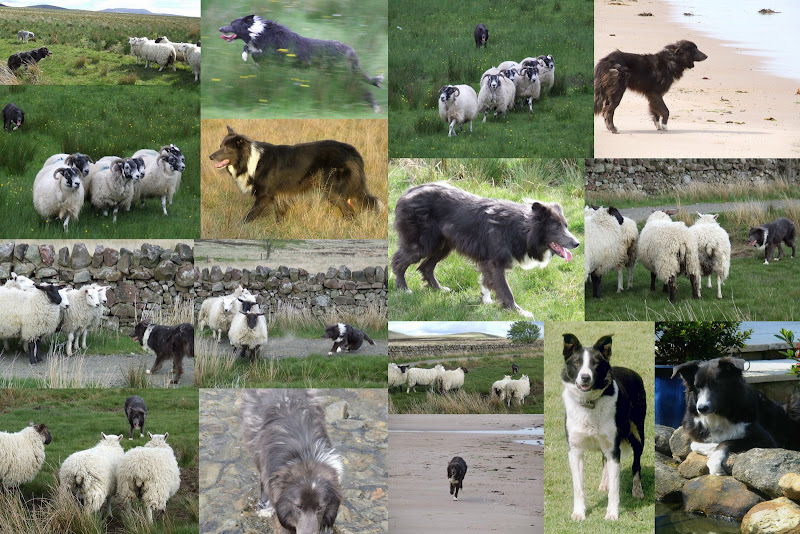 Bottom right is Nidd's sire and dam, Moss and Wenndale Maddie. Moss was a lovely dog, the one I kept after making a memorable trip to Donegal to use Tommy Long's Moss on Kate, Joe's sister. I really enjoyed training Moss but didnt have enough work for him when I was pregnant with my first child. The odd nursery trial wasn't enough for him. So I reluctantly sold him to a local hill farm, and immediately regretted it as he was dead from heat stroke within two weeks. He didn't like to stop working. Maddie worked ok at hand but didnt have the keenness to go much further. 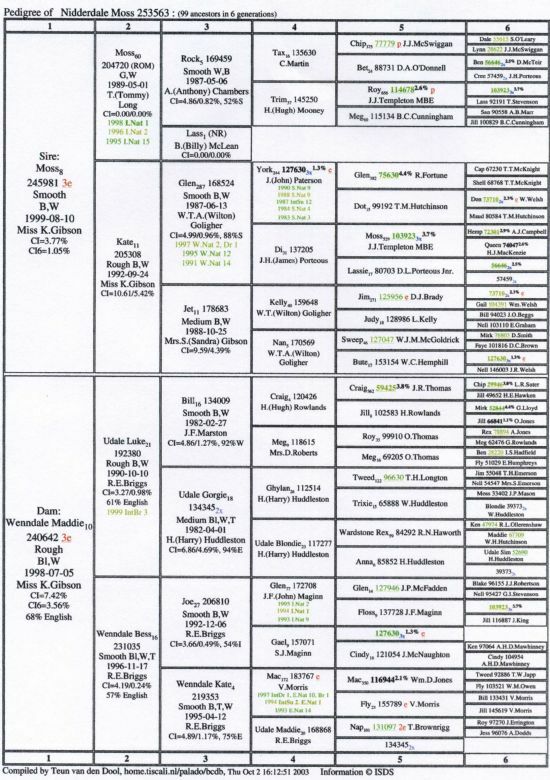 I bred from her because she had a tremendous brother called Bill. He was sold to a geordie man as a pet who offered him to me because the dog was chasing cars and likely to get runover. At six months old, the first time Bill went on sheep, he went around them to twelve o clock and held the sheep to me. A natural. He was also very keen. He would work for both me and Simon, ending up with Simon, maybe a bit too keen for me, at that time. Unfortunately, he died when he was just turned three, before he reached his full potential. Gastric torsion, very rare in border collies more common in large breeds of dogs. With both Moss and Bill, it was very sad for us.